The Supermarine Scimitar was a British naval fighter aircraft operated by the Royal Navy Fleet Air Arm. The prototype for the eventual production version flew in January 1956 and production aircraft were delivered in 1957. It saw service with the Royal Navy from 1958 until 1969, replaced in service by the Blackburn Buccaneer. The Scimitar stemmed from a number of designs from Supermarine for a naval jet aircraft, initially to a requirement for an undercarriage-less fighter aircraft to land on flexible "sprung" rubber decks, which would allow for a lighter and simpler structure. Supermarine's design to meet this requirement was the Type 505, featuring a thin, straight wing and a V-tail (or "butterfly tail") to keep the tail surfaces away from the jet exhausts, and to be powered by two Rolls-Royce Avon turbojets, mounted side-by-side in the fuselage. In 1948, the Admiralty had second thoughts about the undercarriage-less fighter and Supermarine reworked their design by including a nosewheel undercarriage, becoming the Type 508. The Vickers-Supermarine Type 508 was the first Scimitar ancestor and shared the layout of the Type 505, i.e. a twin-engined straight-winged type with a V-tail. Pitch control was by moving the whole tail, with elevators for additional pitch control when working in tandem and to replace the rudder on a conventional tail when working differentially. Ailerons were fitted to the wings for lateral control and leading and trailing edge flaps were also fitted to the wings. An order for three Type 508s was placed in November 1947, to Specification N.9/47. The first Type 508 made its maiden flight from Boscombe Down airfield on 31 August 1951, with the aircraft carrying out carrier trials aboard HMS Eagle in May 1952. The second aircraft had significant differences, carrying a cannon armament and was different enough in detail to be renamed the Type 529, flying for the first time on 29 August 1952. One unusual modification was the larger tailcone for a proposed tail-warning radar. The maximum speed of the straight-winged Type 508 and 529 was relatively modest, with the Type 529 reaching 607 mph (977 km/h) and it had already been decided when the Type 508 first flew, to redesign the third prototype with swept wings to improve performance. The resulting Type 525 also featured conventional swept tail surfaces as well as blown flaps to reduce the aircraft's landing speed and first flew on 27 April 1954. It later crashed but the basic design had already proved sound enough to proceed with an outwardly fairly similar looking aircraft, the Type 544, to specification N.113. A total of 100 were ordered, although the Royal Navy had changed the specification to a low level strike aircraft with nuclear capability rather than a fighter. The first of the Type 544s serving as prototypes for the later production series flew on 19 January 1956. The aircraft evolved more with the third Type 544 incorporating different aerodynamic changes and a stronger airframe for the new low level role - to quote Flight; "To permit uninhibited manoeuvring in thick turbulent air at low levels while carrying heavy loads of strike weapons, the structure is extremely sturdy". Various aerodynamic "fixes" to try and counter pitch-up effects at high speed and altitude included flared-out wing tips and wing fences. The tailplane was also changed from dihedral to anhedral. The combined modifications led to the final Type 544 being considered the "production standard". The first production Scimitar flew on 11 January 1957. The aircraft pioneered fuel flow proportioning and integral main-plane tanks, along with "blown" flying surfaces to reduce landing speeds. At the time of introduction most of the Royal Navy's carriers were quite small and the Scimitar was a comparatively large and powerful aircraft. Landing accidents were common and the introduction of the type was marred by a fatal accident which took the life of Commander John Russell, commanding officer of 803 Naval Air Squadron, the first squadron to operate the Scimitar. After a perfect landing on the newly recommissioned HMS Victorious and in full view of the press, one of the arrestor wires broke, and Russell's Scimitar (serial XD240) fell into the sea. With no means of ejecting through the jammed canopy and despite the best efforts of the crew of the Westland Whirlwind planeguard helicopter to perform a rescue, Russell's Scimitar sank to the bottom and Cdr Russell drowned. The incident was later broadcast by British Pathé News. Overall the Scimitar suffered from a high loss rate; 39 were lost in a number of accidents, amounting to 51 % of the Scimitar's production run. At one time, it held the record of 1,000 maintenance hours per flying hour. Although the Scimitar could operate as a fighter, the interceptor role was covered by the De Havilland Sea Venom and then the de Havilland Sea Vixen. The Scimitar itself was replaced by the Blackburn Buccaneer. The Scimitar was kept initially as a tanker to allow the underpowered Buccaneer S.1 to be launched from aircraft carriers with a useful weapons load. To save weight, the Buccaneer would take off with minimum fuel then top up from a Scimitar. 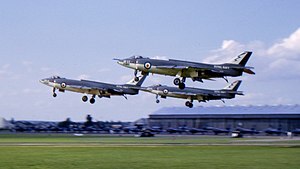 Late in the Scimitar's operational career, examples were flown between 1965 and 1970 by the Fleet Requirements Unit (FRU) based at Bournemouth Airport (Hurn). The FRU was managed by Airwork Services and provided realistic flight operations for land and sea-based naval training units. Single-seat multi-role fighter aircraft, 76 built by Vickers-Armstrong at South Marston. Original order was for 100 aircraft in 1952 later reduced to 76. Scimitar F1 XD220 at the Empire State Aerosciences Museum, formerly at the Intrepid Sea-Air-Space Museum, New York, United States (on loan from the Fleet Air Arm Museum). Scimitar F1 XD317 at the Fleet Air Arm Museum, Yeovilton, England. Scimitar F1 XD332 at the Solent Sky Museum, Southampton, England. ^ a b "Scimitar History." thunder-and-lightnings.co, 5 April 2009. Retrieved: 23 March 2010. ^ Andrews and Morgan 1987, pp. 297–298. ^ Mason 1992, p. 375. ^ Andrews and Morgan 1987, p. 298. ^ a b c Buttler 2001, pp. 158–159. ^ Mason 1992, p. 376. ^ Buttler 2008, p. 56. ^ Buttler 2001, pp. 159–160. ^ a b "Supermarine Scimitar." Flight, 1957. Retrieved: 5 August 2013. ^ Buttler 2008, pp. 62–63. ^ "Flight & Aircraft Engineer." Flight International, 2593, October 1958. ^ British Pathé (29 July 2011). "Trapped Pilot Drowns in Sinking Plane (1958) - British Pathé". Retrieved 21 April 2018 – via YouTube. ^ Sturtivant & Ballance 1994, p. 16. ^ Sturtivant & Ballance 1994, p. 58. ^ Sturtivant & Ballance 1994, p. 125. ^ Sturtivant & Ballance 1994, p. 138. ^ Sturtivant & Ballance 1994, p. 141. ^ Sturtivant & Ballance 1994, p. 152. ^ McGeehan, Patrick. "Anticipating Space Shuttle’s Arrival, Old Warplanes Ship Out." The New York Times, 18 April 2012. ^ Andrews and Morgan 1987, p. 306. ^ Thetford 1978, p. 339. ^ a b Buttler 2001, p. 164. Buttler, Tony. "Database: Supermarine Scimitar". Aeroplane. Volume 36, No. 12, Issue No. 428, December 2008. Buttler, Tony. "Type Analysis: Supermarine Scimitar". International Air Power Review. Norwalk, Connecticut, USA:AIRtime Publishing. Volume Two, Autumn/Fall 2001, pp. 158–173. ISBN 1-880588-34-X, ISSN 1473-9917. Gibbings, David and J.A. Gorman. Scimitar. RNAS Yeovilton, Somerset, UK: Society of Friends of the Fleet Air Arm Museum, 1988. ISBN 0-948251-39-5. Morgan, Eric and John Stevens. The Scimitar File. Tunbridge Wells, Kent, UK: Air Britain (Historians) Ltd., 2000. ISBN 978-0-85130-323-9. Sturtivant, Ray; Ballance, Theo (1994). The Squadrons of The Fleet Air Arm. Tonbridge, Kent: Air-Britain (Historians). ISBN 0-85130-223-8. Wikimedia Commons has media related to Supermarine Scimitar. "Supermarine's New Fighter - the Naval N.113" a 1956 Flight article on the aircraft later to be named the "Scimitar"